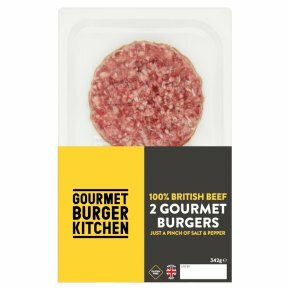 British beef burgers seasoned with salt and black pepper. 100% British beef. Simply seasoned with salt and pepper. Gluten free. Perfectly cooked in approx. 15 minutesWash hands, all surfaces and utensils after touching raw meat. For best results please cook on the barbecue or use a griddle pan. Remove all packaging before cooking.Not suitable for microwave cooking. Do not reheat once cooled. Barbecue 11-15 Minutes. Preheat barbecue. Place burgers on barbecue on a medium heat, turning once until thoroughly cooked, the juices run clear and there is no pink meat. (Take extra care when barbecuing). Grill 11-15 Minutes. Preheat grill. Place burgers on the grill rack under a medium heat, turning occasionally until thoroughly cooked, the juices run clear and there is no pink meat. Griddle Pan 11-15 Minutes. Preheat griddle pan. Place burgers on griddle pan on medium heat, turning once until thoroughly cooked, the juices run clear and there is no pink meat.